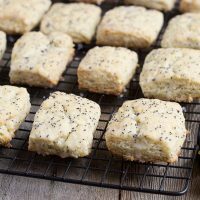 Easy, one-bowl Glazed Lemon Poppy Seed Scones, with a lovely lemon glaze with even more poppy seeds in it! A perfect lemon treat to enjoy any time of day. I’m not Virgo (Capricorn, here), but I wasted little time getting in to the kitchen to bake up a batch of these. One-bowl easy, perfectly lemony, topped with a wonderful tangy/sweet glaze and full of poppy seeds, these scones should go on everyone’s baking list this citrus season. I made these with regular lemons. If you have some Meyer lemons, they would be just as lovely, I’m sure. 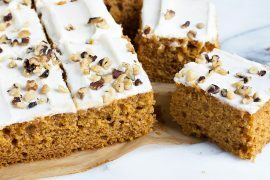 The recipe specifies using a food processor, but these can easily be made without the aid of a machine, in a large bowl with a pastry cutter to cut the butter in to the flour mixture. These are quite rustic in their shape and size, as they are simply cut in to rectangles from the rolled out dough. If you’d like something a little more refined, you can trim the irregular outside edges and cut in to more uniform rectangles or triangles. You could also use a cutter, to cut into rounds. 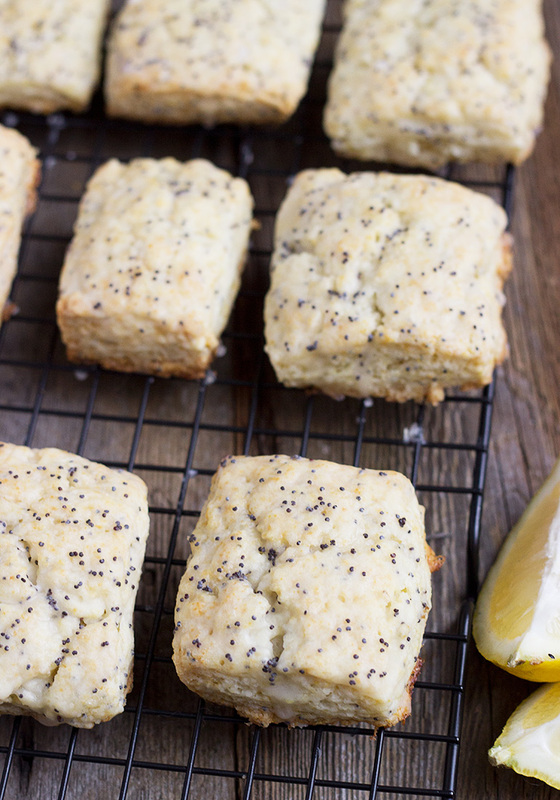 Easy, delicious one-bowl lemon scones with poppy seeds and lemon both in and on the scones. You can easily make these without a food processor. Just use a large bowl and a pastry cutter to cut the butter in to the flour mixture. Cube the butter and place in a bowl in the freezer until needed. In a food processor, pulse to combine the flour, sugar, baking powder, lemon zest, salt and 2 tsp of poppy seeds. Add the butter cubes and pulse until the mixture resembles coarse meal. Add the heavy cream and pulse until evenly moistened. remove dough to a lightly floured work surface. Gather dough together in to a ball. Using a floured rolling pin, roll dough in to a 6x9-inch rectangle. Using a sharp knife, cut dough in to 12-16 scones, depending on how big (or small) you might like them. Transfer scones to prepared baking sheet. Brush top of scones with cream. Bake for 25 minutes, or until firm and lightly golden. 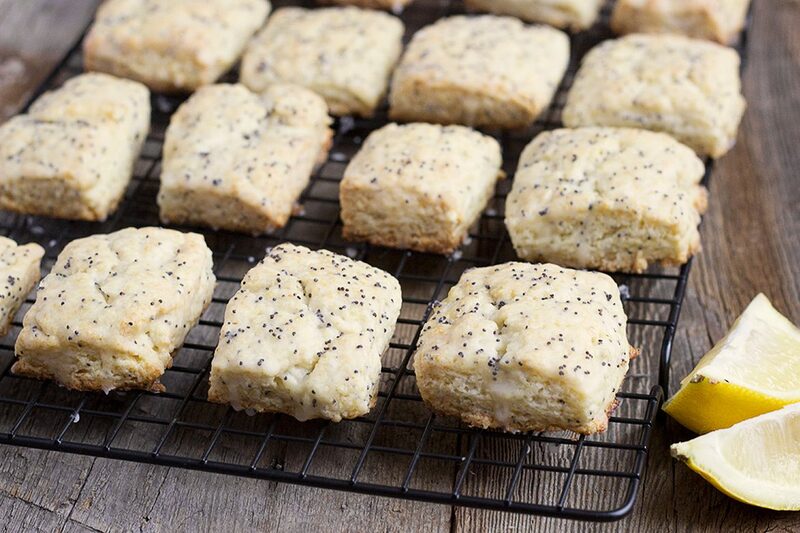 Transfer scones to a cooling rack with a baking sheet underneath to cool completely. Prepare the glaze by mixing the icing sugar, lemon juice and poppy seeds until smooth. Brush cooled scones with glaze and let stand until the glaze sets, about 15 minutes. These scones keep well at room temperature for a couple of days or freeze extras to enjoy any time. The first time I made these they were so delicious, so I was excited to make them again with a leftover cup of heavy cream I had available. My comments from earlier have been deleted, so I could only remember that the glaze turned out a bit runny and that I should use less lemon juice this time. So I used just a little less than the 1/4 cup. Unfortunately this time I now did not have enough glaze to fully cover the scones. Then I remembered that the recipe originally said 1/4-1/3 cup lemon juice and that last time I had used the full 1/3 c, so I really had meant this time to use a little less than 1/3 cup. They were still delicious but did not have quite the sweetness and lemon flavor due to not being fully infused with the glaze. Hopefully next time 3 times will be the charm. 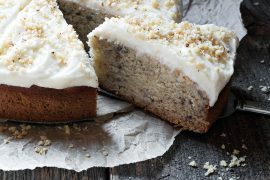 Lemon and poppyseed is the perfect combo! I love how easy these are too. Must try! These were amazing. We (my granddaughter, Luci and I) doubled the zest and poppy seed, and added two drops of Lorann lemon oil. Making them again with orange zest! They were really yummy three and four days later. So glad you enjoyed them and I agree, the glaze makes for the perfect balance. You could probably try a bit more icing sugar in the glaze if you make them again, to help it stay put a bit better. I’m a Virgo so that explains why these scones really speak to me! They remind me of some we devoured in Ireland. 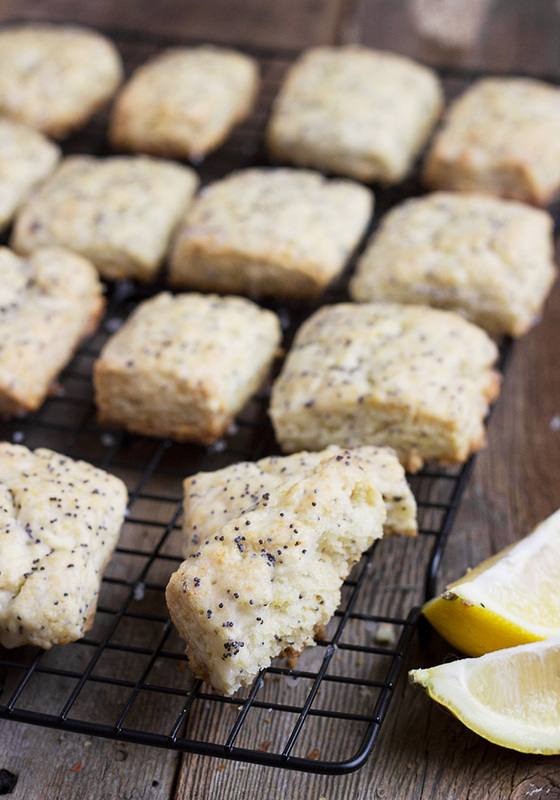 Poppy seeds and lemon must be terrific in these flaky, delicious treats! By the way, happy birthday Capricorn! I love, love, love lemon poppyseed anything Jennifer, so they NEED to be baked up real soon at my house! They look perfect. And that glaze! Ha! I just finished making and shooting scones! We’re two peas in a pod today. 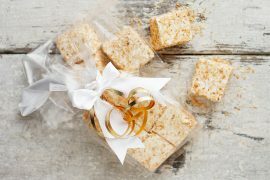 These look fabulous, I love lemon in baked goods and sure wish that one with the bite had been my bite! Great minds think alike :) Lemon scones are my absolutely favourite flavour for scones!